Mike, Will, Dustin, and Lucas are typical pre-teen boys living in tiny Hawkins, Indiana in the 1980s. They love Dungeons & Dragons, playing videogames at the local arcade, and riding their bikes. But things get strange when Will disappears in the woods while riding home one night, even as a mysterious girl – known only as “Eleven” – suddenly appears in town with a shaved head and wearing a hospital gown. As Will’s older brother, mother (Winona Ryder), and friends search desperately for him, the clues all seem to lead to a nearby U.S. Government energy lab, where strange experiments are being conducted by a team headed by Dr. Brenner (Matthew Modine). Before long, it’s clear that this lab, Eleven’s origins, and Will’s fate are all intertwined in a dangerous mystery that Will’s friends are determined to solve. When Stranger Things debuted on Netflix in the summer of 2016, it took the online geek community by storm, particularly its Generation X members. The series is a curious and intriguing blend of the horror and science fiction genres that recalls a host of films of the 1980s, including Explorers, The Goonies, Stand by Me, Poltergeist, The Monster Squad, The Lost Boys, the novels (and film adaptations) of Stephen King, and pretty much every B-horror film of the decade. The series’ young cast were all virtual unknowns, but they’re instantly recognizable and relatable to anyone who crew up in that era. The show is a nostalgic throwback and yet manages to feel fresh too, by turns creepy, curious, and even touching. Most of all, it excels at the creation of edgy atmosphere even in familiar and mundane environments; an unsettled mood pervades every episode. This, along with the cast’s charisma, helps to carry the narrative forward even when it feels a tad muddled. Above all else, Stranger Things is just a helluva lot of fun. It’s the TV equivalent of a can of Pringles or a bag of Cheetos, and that’s meant in the best way possible. This is an incredibly binge-worthy viewing experience and you’re sure to enjoy every minute. Netflix’s self-produced 4K Ultra HD release includes all 8 episodes of the first season in their original 2.00:1 aspect ratio, as seen in the streaming release. Stranger Things was shot digitally in the Redcode RAW codec (in 6K for Season 1) using RED Epic Dragon cameras. The series was finished as 4K DI and that source is presented here in full native 2160p. The image is excellent looking on the whole, with highly-refined detail and precise texturing – a modest but noticeable improvement in detail over the already good looking Blu-ray image (you can read our review of that here). That’s the good news. The bad news is that, unlike virtually every other title on this format (and the Netflix streaming 4K version too for that matter), there’s no High Dynamic Range here – no Dolby Vision, not even HDR10. Now… to be fair, there are going to be catalog 4K titles, eventually, that don’t have HDR simply because there isn’t sufficient information in the negative to do an acceptable HDR grade. But in the case of Stranger Things, the lack of HDR is absolutely inexcusable, especially considering the fact that the series has had HDR grades done for both HDR10 and Dolby Vision. There’s still a slight improvement in color here in the 4K image over the regular Blu-ray – colors are just a tiny bit richer and more natural looking – and I suspect this is simply due to the difference between 8-bit and 10-bit color. Interestingly, the FBI anti-piracy logos at the beginning of the disc do have HDR10, but then it goes away. So it seems clear that the original plan was to include HDR… until something happened. More on that in a moment. On the audio front, there’s more bad news. While the Blu-ray includes a Dolby TrueHD lossless mix, the 4K Ultra HD version includes lossy English 5.1 Dolby Digital only, along with English 2.0 Descriptive Audio (this was 5.1 on the BD) and optional English SDH subtitles. Now, look… this show doesn’t exactly have the most dynamic audio – even the lossless mix used the surround channels mostly for atmospheric cues. But there’s simply no acceptable reason for the 4K Ultra HD version of any title to have lossy audio when the Blu-ray version has lossless. Don’t get me wrong, the mix is fine. In fact, it sounds great. But like the lack of HDR, the drop to lossy from lossless is inexcusable. So why did this happen? I suspect there are two possible reasons (and the cynic in me suggests that it may be a little bit of both). 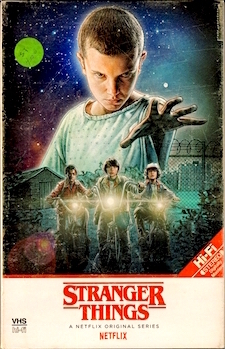 First, while the Blu-ray version of Stranger Things: Season 1 streeted on October 17, the 4K version was not released the same day; it arrived a full month later. Now… HBO’s Westworld: Season 1 was promoted as the first TV title to be released on 4K UHD, with a street date of November 7. Stranger Things was never officially announced for release on either Blu-ray or 4K, and there was never a solid street date for the 4K SKU (some stores already have the disc in stock, while other stores do not, but their inventory systems say the street date is 11/28 or 12/5). Reading between the lines, I suspect that Netflix rushed the 4K version of Stranger Things in order to try and get it out in stores as close to HBO’s Westworld as possible (indeed, the first reports of the title appearing in select Target stores began circulating on the Internet that same week). To facilitate this, they simply have opted to ditch the HDR. I also strongly suspect that Netflix wanted the 4K version of the series to use the same menus, packaging configuration, and authoring flow as the BDs – which means the whole season on 2 discs. So in order to fit the larger 4K video files on the discs, they had to ditch the TrueHD audio in favor of smaller Dolby Digital files.. and they had to go from 5.1 Descriptive Audio to 2.0 as well. Whatever the reasons, Netflix has chosen to compromise both the image and sound quality of their UHD release in very unfortunate ways for a format that is supposed to represent the pinnacle of A/V quality. So how to grade this set? For Video, we gave the Blu-ray version of this series an A-. In terms of detail, the 4K UHD would easily merit an A… but the lack of HDR is just shameful. I’m tempted to give it an F just because. I’ve chosen instead not to grade the video here, but to give you enough information to make up your own minds about the quality. For the Audio, we gave the Blu-ray version a B+. Given the nature of the series’ audio, the drop from lossless to lossy nowhere near as egregious as the lack of HDR, but we’d downgrade the 5.1 Dolby Digital track grade to a B, again just because. The only “extras” included on the actual discs are preview trailers for Stranger Things: Season 2 as well as Marvel’s The Defenders, both in 1080p HD only. Fortunately, unlike the Blu-ray version, you can skip these on 4K and go right to the menus. The package also includes those same Blu-rays, with the full season on 2 discs. There’s another collectible poster too, but a different one than the BD set – it’s the Season 2 teaser poster. Again, the packaging is quite clever, reproducing the look of a vintage 1980s (if oversized) VHS rental release of the series, complete with faux shelf wear, faded artwork, and stickers on the box. It’s different from the regular Blu-ray packaging in that the artwork on the slipcase is different and it has a white band across the bottom with an additional red “Hi-Fi” logo. Inside, the fake VHS case also has slightly different markings on it. In the end, is the 4K version of Stranger Things: Season 1 worth the extra $5 over standard Blu-ray? I don’t know. Maybe. The 4K discs are at least all region, so those of you outside the US may prefer them just for that reason alone. But it’s really damned irritating that Netflix didn’t at least warn fans that a 4K version was coming, because I suspect a lot of them purchased the Blu-ray and would rather have waited for 4K. So anyway, that’s the deal. It’s a bit of a Sophie’s choice. Buyer beware.